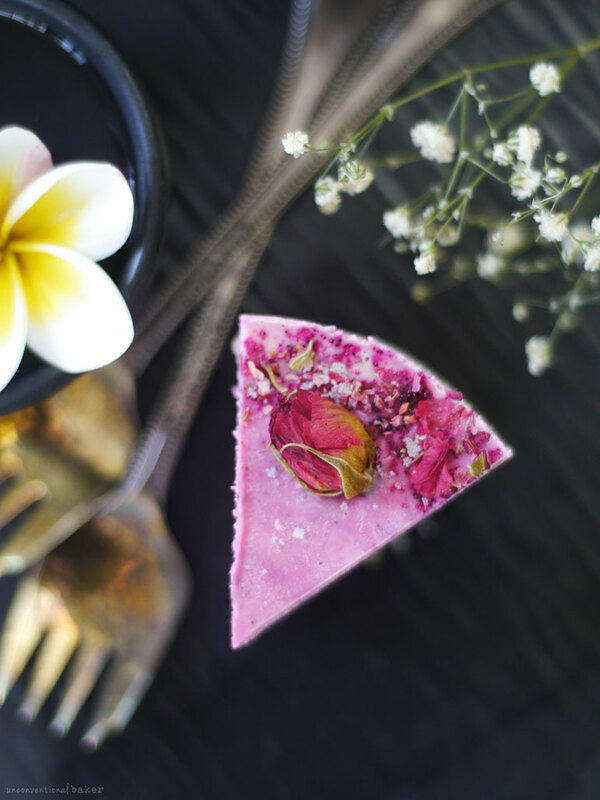 Pink dragon fruit (pitaya) + rose water in a creamy, delicate raw cheesecake is such a simple, dreamy treat — made all the more lush and creamy with the help of a little coconut cream instead of oil. Now about that pink pitaya… finding pink dragon fruit in Canada (or at least in Ontario) has been mission impossible from day one — and I’ve looked everywhere! (or at least it feels like). So much white pitaya, and sometimes a yellow variety will crop up too (both of which I adore of course), but no pink pitaya to be found for the life of me. To this day I’ve had a taste of fresh pink dragon fruit once — all the way over in Malaysia! Using a dehydrated powdered form of fruit creates a much creamier cake since there isn’t extra liquid being introduced into the mix via the fruit juice / water content — i.e. amazing cake texture for the win. Believe it or not, I actually only used the tiniest amount of powder for this cake (it is a tiny cake of course, so it’s not overly disproportionate) to get all these pretty shades in there. You could add a lot more to up the flavor of the pitaya or to get deeper shades. I liked the balance between the hint of pitaya and the hint of rose — it seems the perfect flavor pairing. I’ve been repeating it in my smoothies some days since — just love it. Also keep in mind that fruit powder is very concentrated. I couldn’t find an exact stat for dragon fruit, but an example I have experience with would be — 1 whole beet yields 1 tbsp dehydrated powder. 1 Vitamix pitcher full of dehydrated greens yields about 2-3 tbsp powder. I imagine just based on my own experience of making fruit and veg powders that 1 pitaya would probably be about 2 tsp of powder or so (which also explains the cost of fruit powders — imagine how many pitayas had to be concentrated into that powder baggy!). Now to the sourcing part — I got my dragon fruit powder from Just Blends, whom I mentioned in more detail in this blue surf cake recipe post. In short though, it’s a small-scale company I can really recommend — the products are really good quality, relatively affordable, and ship world-wide. 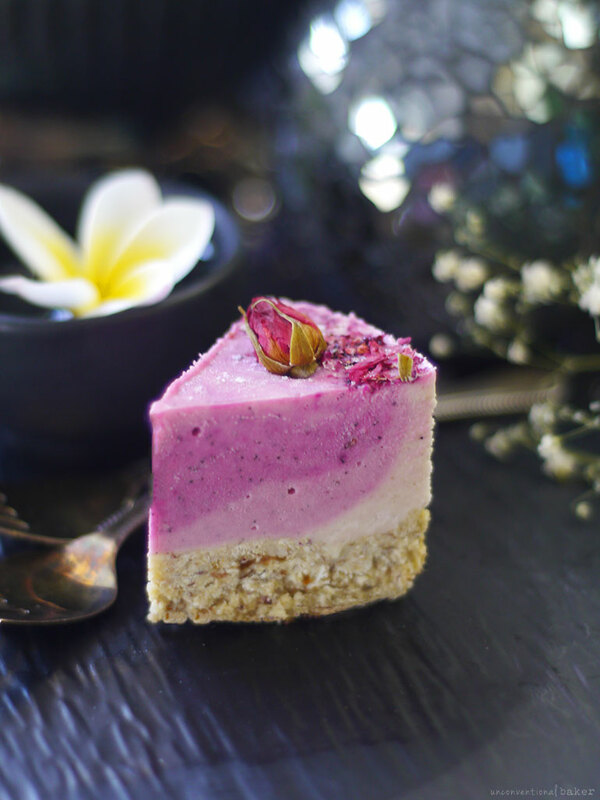 If you are unable to get pitaya powder, you can go with a bit of beetroot powder here or another berry powder instead, or use some natural food coloring. 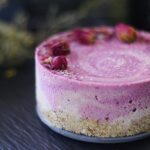 But if you are curious to try it out, I say give the pitaya powder a try (if you haven’t already) — it’s a wholefoods, great quality, nutritious product, and will help you make beautiful pink cakes, smoothies, and so on. I also worked out a discount for Unconventional Baker readers with Steph, the owner of Just Blends, so if you buy from there and want to get a better price use coupon code: UB10% to get ten percent off your purchase. 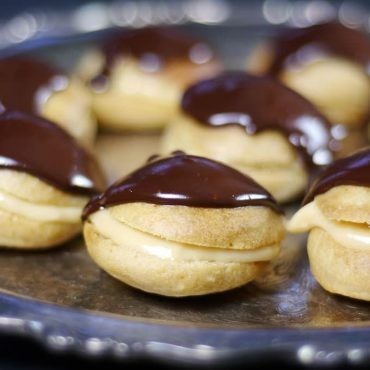 Once you’ve got the powder, you’re all set on your way to delicious, lightly fruity, fragrant, and exotic little cakes. As per usual, this recipe is for a tiny 4″ cake (using this type of springform pan). You can also make a flatter 5″ cake if you prefer to use a 5″ springform, or simply use some silicone cupcake molds or a parchment-lined small tupperware container for alternative sizes. If you want to make a larger-sized cake, you can refer to the downloadable cake sizing up/down guide at the bottom of this post. Also please note, since it’s been coming up a fair bit in questions — I use a classic old-fashioned Vitamix for my recipes. Many of the newer blenders, including the new low profile Vitamixes have a wider pitcher bottom, which means a tiny recipe like this won’t work properly — for the smoothest results in one of these blenders you’ll need to double the recipe just because you need a bit more mixture volume to get things blending properly. Alternatively, if you’re a wide-pitcher power blender owner but still want to make a small batch of this cake, you can use a magic bullet as Janel has done in the video above — the results aren’t as creamy smooth, but creamy smooth enough :) and still very beautiful. 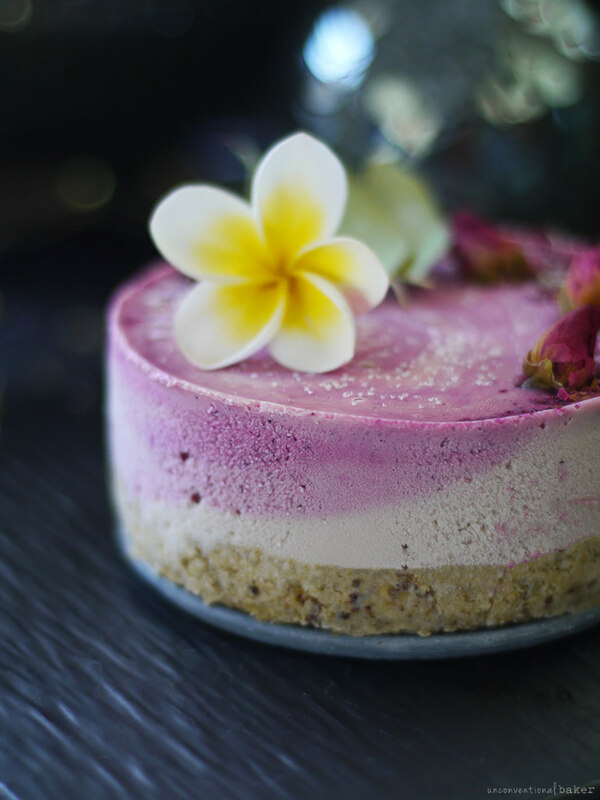 A lush, creamy raw cashew cheesecake with beautiful pink dragon fruit powder. This recipe is vegan, gluten-free, and dairy-free, and made without added oils. Process all crust ingredients in a food processor. Transfer into a 4″ springform pan and press down into an even flat crust. Freeze while working on next step. 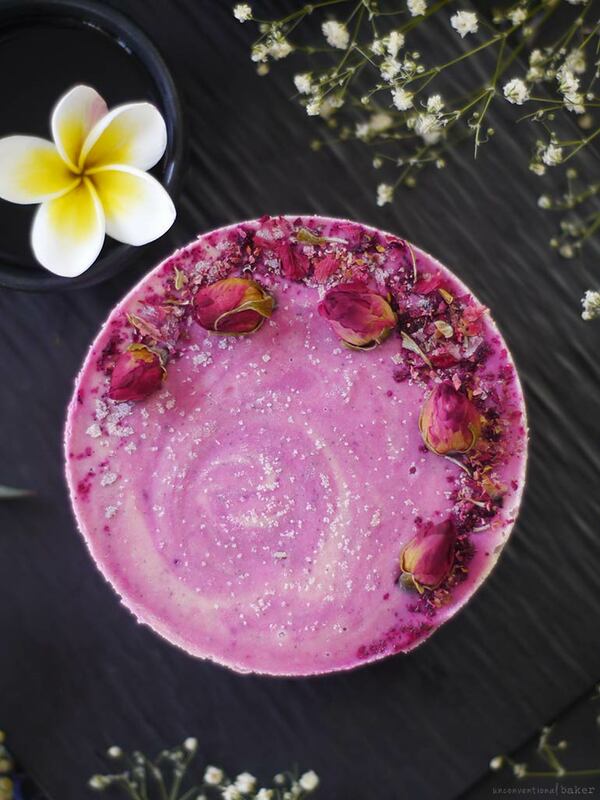 Add all filling ingredients, BUT ONLY ¼ tsp pitaya powder, to a power blender and blend into a smooth creamy consistency. Remove a third of this mixture and pour it into the springform pan over the crust, trying to keep it mostly to one side (let’s say keep it to the right). Add in ½ a tsp more pitaya powder to the remaining mixture in the blender and blend once again to combine. Transfer half this mixture into the springform pan, placing it mostly into the center, or slightly to the left side. Add another ½ tsp pitaya powder to the remaining mixture in the blender and blend to combine. Transfer this mixture into the pan, pouring it mostly to the left. Now use a skewer or a small spoon to lightly swirl the mixtures together. I used a circular motion and went mostly around the edges of the pan to create a swirled effect. Feel free to improvise — just don’t over-mix or the different layers will merge into one color. Decorate with desired toppings. Freeze for 6 hours or overnight. Keep frozen until serving time. Slice and enjoy! Keep any leftovers frozen. *Or alternatively use a raw sweetener of your choice, like agave, coconut nectar, etc. **To pre-soak nuts: place in a glass bowl, cover with water, and leave to soak for 4 hours (or overnight in the fridge). Then strain and discard the water. For a quick pre-soak, cover with boiled water and soak for 15 mins, then strain and discard water. (Note: this technique doesn’t preserve the nutrition of the recipe as well as the traditional soaking technique above). Note: the purpose of soaking the nuts is to re-hydrate them and plump them up for blending into a smooth, cheesecake-like consistency. Proper soaking techniques also maximize nutrition and digestibility. If you’re interested in learning more about nut soaking and other dessert prep tips and tricks, I delve into these subjects in detail in my book Unconventional Treats. ***The coconut cream used in this recipe is only the firm white stuff gathered at the top of a chilled can of full-fat coconut milk. You’ll need to chill the can in an upright position overnight for the cream to separate from the water and surface up to the top. I used the Thai Kitchen full fat coconut milk cans for this recipe and I find that the large 400ml cans yield about ¾ cups cream each once chilled and separated, and the tiny cans (160ml) yield about ⅓ cup cream each (I prefer working with the smaller cans as they seem to separate better). Reserve the remaining water for other uses, only use the firm white cream for the ice cream here. Note that it’s very important for the full fat coconut milk cans to be chilled first so it separates. This post contains affiliate links to the following products I use / recommend for this recipe: edible rose buds, rosewater, 4″ cake pan and 5″ cake pan, silicone liners, Vitamix 1, and Vitamix 2, natural food coloring, raw cashews, maple syrup, full fat coconut milk, raw ground vanilla bean, salt, a food processor, and the Just Blends powders if you use the coupon code UB10% to get a 10% discount off your purchase. These recipes look amazing! Any chance these are able to be made vegan but without nuts? Cashew and Macadamia seem to be the go to in vegan desserts. Both my kids are allergic. Hoping there is a tasty option for them. Hi Brandi — I get the no cashew / maca restriction being difficult to avoid in vegan recipes. 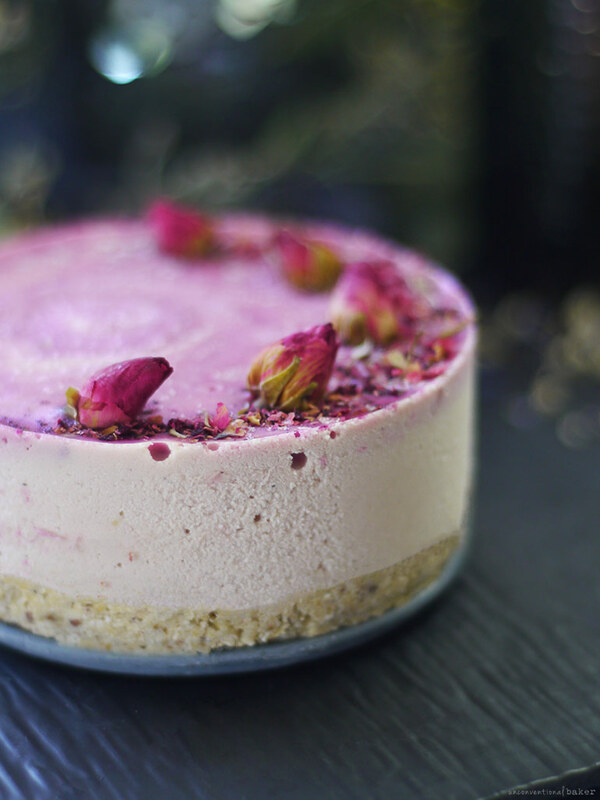 There is however a whole section of nut-free desserts, including lots of cheesecake on the recipes page :) Just make sure to check off the “nut-free” and “cake” categories. 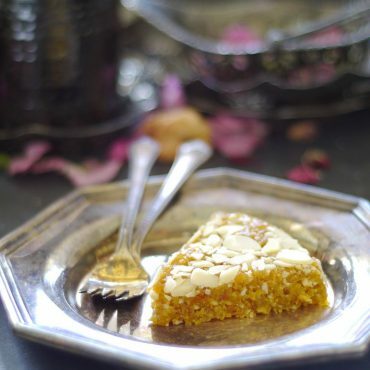 You’ll find some similar recipes to this cake there, made without nuts. Hey there! I actually have frozen pink pitaya purée easier at hand and less expensive than the powder but I’m not sure how this would affect the recipe since it contains more liquid. If I could get some tips I would be forever grateful!!! 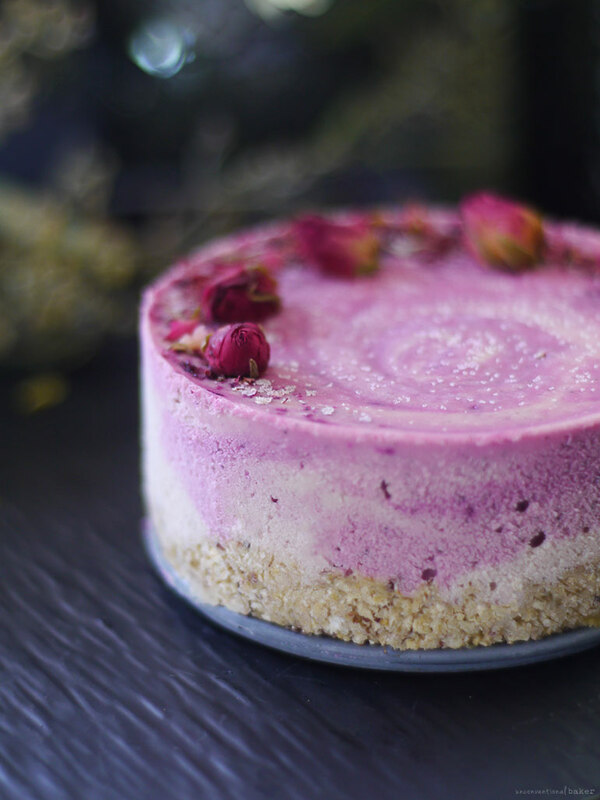 Hi Jan, this recipe is for a “raw cheesecake” which is a special type of cake made without dairy (or cooking), but which mimics the consistency of cheesecake. Gorgeous and creative, as always, Audrey. I really need to start buying powders because constantly figuring out the water content of different fruits and how much coconut I have to add to compensate!